Identification of soil water conservation structures (SWCs) necessitates as the proximity of study area (Shivganga watershed) to the Western Ghats imparts high rainfall and runoff, resulting to accelerate soil erosion. To decrease soil erosion and improve water storage as well as recharge, the investigation of new possible structures is necessary. With this intent, suitable sites for SWC structures (check dam and percolation ponds) were identified by using hydro-spatial data such as soil, land use/cover, slope, runoff, infiltration data from IRS P6 LISS-IV imagery and other collateral data. Further, acquired data were processed to derive runoff by employing Soil Conservation Service Curve Number (SCS-CN) method and infiltration by Allen (2008) method. The Integrated Mission for Sustainable Development (IMSD) specifications were used for the identification of locations for constructing SWC structures. The results revealed that about 28% area is suitable for implementation of SWC structures. Total 45 locations SWC structures were derived with the present method, out of that 20 were already built. The superimposition of derived and existing locations shows (80-100%) accuracy, authenticates the reliability of the method. The present modified method will definitely help in speedy identification of a location for SWC structures. A modified method using infiltration zone with conventional layers showed accurate identification of SWC site. High runoff along with high soil erosion and proximity of Western Ghats demand identification of SWC site. This modified method requires less data, achieve higher accuracy and capability of handling regional data. 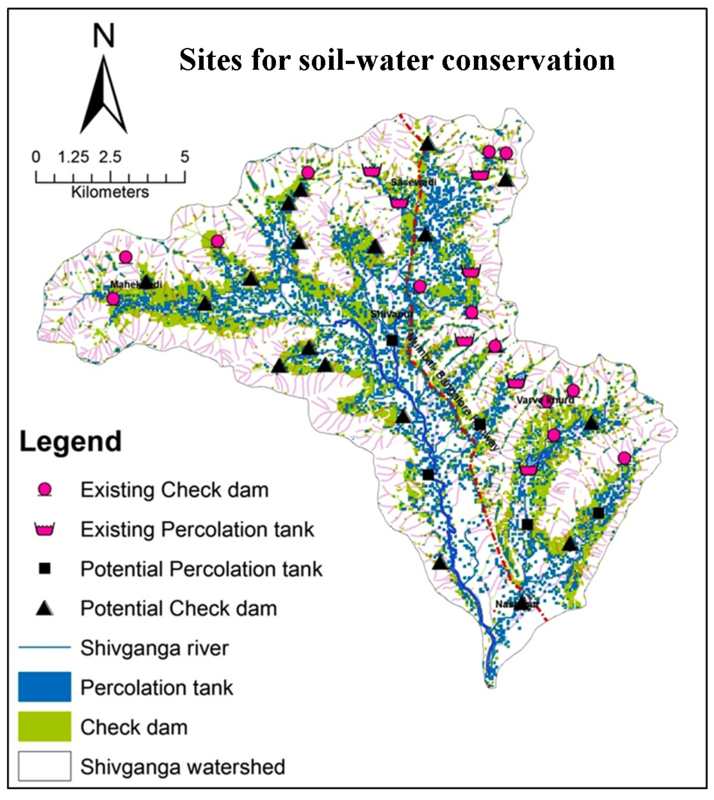 We used hydro-geological data for identification of soil-water conservation structure using geospatial tools.